The New York Public Library Digital Collections has a massive array of images digitized. There are over 650,000 images, maps, manuscripts and more to sift through. A lot of the items in these collections are in the public domain so “everyone has the freedom to enjoy and reuse these materials in almost limitless ways.” I decided that it would be good practice if I selected a few of these images and tried to retouch them. I picked through some of the public domain collections looking for suitable images. 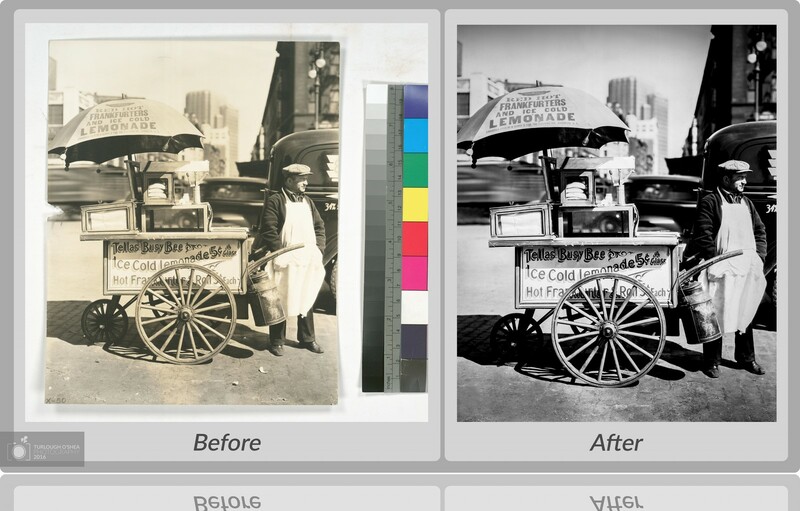 In the ‘Changing New York‘ section several images stood out as being suitable for retouching. I selected and downloaded 10 or so images. I then refined my selection further to end up with the images displayed on this page. All the work done during these retouchings was completed using either Adobe Lightroom 2015 or Adobe Photoshop CC. The colour, sharpening, vignette, cropping and some noise removal all happened in Lightroom. Photoshop was saves for more technical work such as spot removal, fixing errors, adding broken sections of photos and of course make the ‘before and after’ template. I got my inspiration for going through some of the collections and selecting photos to retouch from a video on Serge Ramelli‘s youtube channel. Check him out if you have time. He’s very informative and can help teach you a lot!